This is the brand new Volkswagen Caddy Maxi Life, the MPV based on the Caddy van that, like an Olympic shot-putter, is unapologetically bulky in the pursuit of being good at what it does. 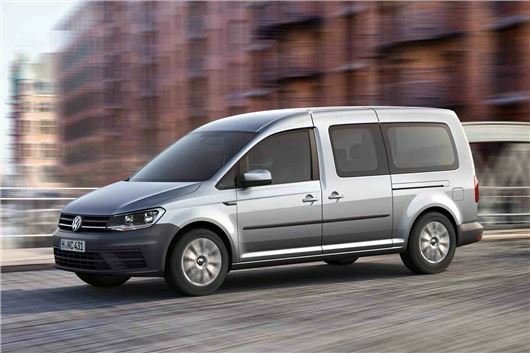 The new Caddy, the shorter wheelbase version, was unveiled recently in Poznan, Poland, but this is the first time we've seen the long wheelbase Maxi van, and its Maxi Life MPV partner. It's 32cm longer than the regular Caddy, meaning that inside it's as spacious as can be. Statistically it's an excellent family car, with two rows of seats behind the driver and front passenger, plus a 530-litre boot. The third row can be removed, liberating a 1,350-litre boot space, and with the second row gone, it ups to a whopping 3,700 litres. In total, a 4.7m3 load space is available, making this a true van as well as a family car. Volkswagen claims state-of-the-art tech for the Caddy, with the latest generation of EU6 qualifying TDI diesel and TSI petrol engines available. Power starts at 75PS and reaches a heady 150PS. It also has emergency city braking, which applies the brakes if a low speed collission is imminent, and a system that helps prevent knock-on crashes by applying the brakes automoatically after an initial impact; one fifth of all accidents involving injuries are as a result of collisions with more than one obstace, says Volkswagen. Adaptive cruise control will be available too, as will Volkswagen's latest colour touchscreen infotainment unit, including more common stuff like Bluetooth phone connectivity and DAB radio. The UK specification is yet to be finalised, but with a German launch in June, expect the Caddy to hit the shops over here by autumn. As an owner of a 14 plate Ford Tourneo Connect, having previously owned a Fiat Doblo and Peugeot Partner Tepee, I am very interested in this vehicle. Honest john, please keep your website readers updated.